Inspired by the rules and finely-tuned constants governing our universe, Circuit Explorations is an attempt at creating a complex system from scratch. Identical analog electronic circuits are assembled into a arbitrary network and its interaction rules are tuned in a manual search process. The search for complexity – guided by visualization and sonification – becomes a doomed performance as the space of possible system configurations turns out to be vast and overwhelming. Circuit Explorations builds on the question if complex behavior can emerge from any system as long as it follows the guidelines for emergence that were extracted from studying complex systems in nature. The research is based on the hypothesis that a true understanding of the necessary conditions for complex systems would allow the creation of new non-yet-existing complex systems. An analog system is made from electronic circuits, and its dynamics are monitored and represented in form of aesthetically driven visualizations and sonifications that give the human observer the task to determine the system’s level of complexity. The synthesis of complex systems by man has so far mostly been limited to the artificial recreation of natural complex systems. Applications using artificial neural networks or evolutionary algorithms are designed to exhibit specific emergent phenomena and are based on the reverse-engineering of these phenomena from nature. 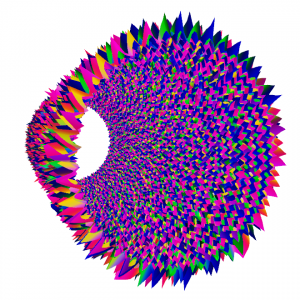 Studies of Cellular Automata show a different approach to complex systems, as they start from the bottom-up with the design of the system components without looking for a specific global behavior as a result. Complex behavior is found in a brute force search through the finite space of possible system setups. The discrete and confined world of cellular automata is a perfect study ground for complex systems and allows the analysis and categorization of different automata rules into simple, complex or random behavior (Wolfram, 1984). 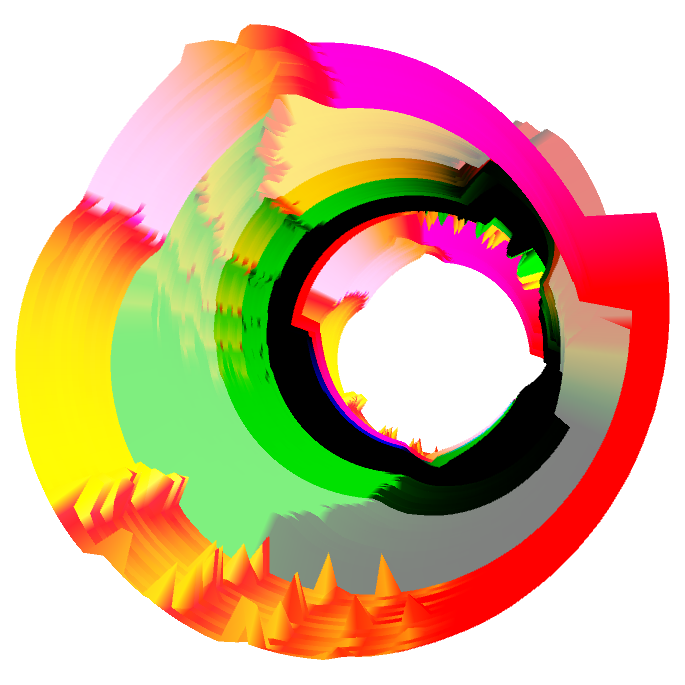 The so-called lambda parameter proves that complex behavior occurs on the edge between chaos and order (Langton, 1990). 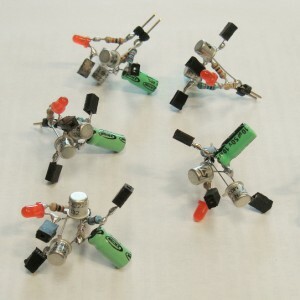 Small electronic circuits made from analog components (resistors, capacitors, transistors, inductors, diodes) serve as building blocks for a larger network of interconnected units. The circuit schematics for the individual units are kept simple in their number of components and are deliberately not designed to forcefully recreate behaviors already found in nature (circuits mimicking neuron behavior). The network consists of many units with similar simple circuit designs that produce predictable behavior in form of oscillation. Each unit has input and output connections linked to one or more other units in the network. By linking these simple circuits up into a large network, all the electronic circuits are interconnected, influence each other and cause an overall more complex behavior. The implementation of the hardware setup in form of a modular kit allows for a more free and exploratory plug-and-play research. The connections between the circuit units are made with wires. The first round of Multivibrator circuit units. Their legs just support the power supply. 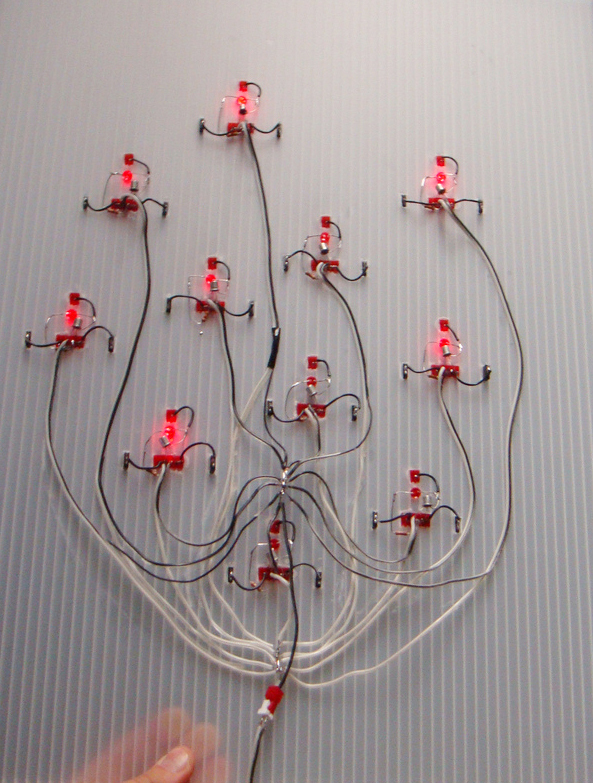 Interaction connections and sensor readings are made with direct wire connections to female pins in the sculpture. Analog circuit components have been chosen as the building blocks for this research to explore the potentials of analog computing and emphasize the differences between digital and analog systems. The infinite amount of signal resolution and the real-time parallel processing of analog electronics offers qualities different to computer simulations. Complex systems in nature are open systems and operate under conditions far from equilibrium. They need a constant flow of energy in interaction with their environment to fully exhibit their emergent properties. Their immediate surroundings are the product of many interacting forces that ultimately lead to deterministic chaos. By being placed in a noisy environment at the edge of chaos and order systems are driven to grow robust and show more complex behavior. In contrast to digital implementations Circuit Explorations is designed from analog electronic components and is automatically placed in a world full of natural occurring noise. In the same way as cellular automata rely on the activation of a few of their cells to be able to show complex patterns, the system here could rely on external perturbations for activation. The stimuli could come from the naturally occurring voltage fluctuation in the power supply for the circuit, electronic noise originating from the circuit itself, or from specifically placed sensor components that change the circuit dynamics by reacting to various stimuli from the outside. 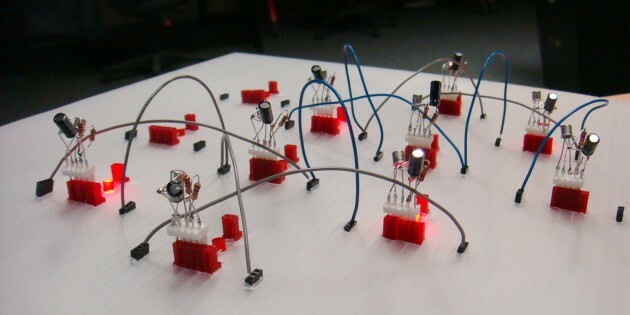 A semi-transparent board that has the power connection and LED indicators wired at the back (visible here), and allows a modular plugin of circuit units in the front. Sensors readings from the circuit are used for a screen-based visualization and software-based sonification. The data representations build on the human ability to perceive structure in visual and auditory information and reveal linear, random or complex behavior in form of different pattern formations. A system is defined as complex if it is possible to detect macro-scale patterns in its behavior that seem structured yet not simply reducible to the behavior of its parts. 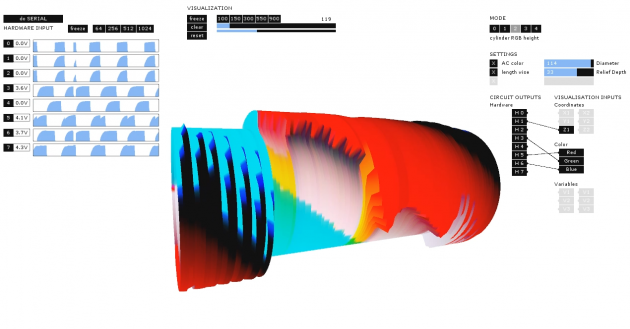 Creative data visualization methods serve as possible tools for scientific inquiry. They encourage pattern discovery beyond the palette of prior knowledge and unite Art and Science’s common goal of making the invisible visible. The data visualization doesn’t judge the signal character and leaves the evaluation of the system behavior to the human observer. The observer becomes part of the system as his visual perception receives the task of pattern recognition and pattern discovery and his cognition the task to determine the system’s level of complexity. The observer has the option to adjust the visualization or to adjust the created system, if after repeated study no signs of complex patterns are found. In the process of research the system, the visualization and the observer will undergo a series of changes until the possible discovery of true emergent behavior. A large part of the human brain is devoted to the perception of visual stimuli and recognition of patterns. When presented with structured visual information the human vision decodes the information and compares it with previous observations stored in memory. If a suitable match is found, the pattern is officially recognized. The human brain has been trained to recognize patterns in almost the same way as pattern recognition software through iterative confrontation with patterns in combination with their correct classification. Yet if confronted with new unrecognized visual patterns that appear initially structureless, human creative thinking and intuition surpass algorithmic software and are eventually able to create n hypothesis about the hidden order behind the pattern. So far the research in Circuit Explorations has not led to any discoveries of complex behavior. Most observed patterns lie in the realm of linearity. Yet the acceptance of the unlikelihood of finding signs of emergence is what defines the search process. It is a homage to the fine-tuned universe and its fundamental constants. Only slight variations in any of those values and the big bang might not have let to the emergence of life, if even to the formation of planets and solar systems. Posted in Projects and tagged 2009, 2010, Arduino, Circuit Explorations, complex systems, data visualization, electronics, noise, openframeworks, oscillator, pattern discovery, pattern recognition.